The 30.56 metre motor yacht Kaytoo, listed for sale by Michael Mahan at Worth Avenue Yachts, has been sold with the buyer introduced by Ben Mahler at Waterfront Yacht Brokerage. Built in GRP by US yard Paragon Motor Yachts to a design by Scott Robinson, she was delivered in 2015 as a Skymaster 100 model. A versatile interior by Marty Lowe accommodates up to nine guests in four cabins comprising a master suite, VIP suite, double and a triple. All guest cabins come with entertainment centres, television screens and en suite bathroom facilities while the crew quarters sleep four staff. The main deck saloon offers soaring ceilings complemented by electric window treatments and hardwood floors. Aft to starboard is a well-appointed wet bar while along the port side is a stylish and comfortable sofa. Forward to port is the day head and to starboard is a games table just forward of a large television screen on a rise and fall mechanism. Accessed from a stairway on the private owner’s deck, the skybridge provides a charming area to take in the scenery. The skybridge offers both forward and aft facing seating and features a remote navigation station. 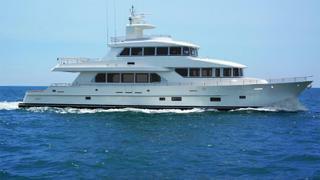 The bow is accessed from the wide walk around side decks from the aft deck or the pilot house doors. On the foredeck there is a booth seating area for six guests that can be converted to a large sun pad. Her top speed is 19 knots and her power comes from two 1,550hp MAN V12-1550 diesel engines.